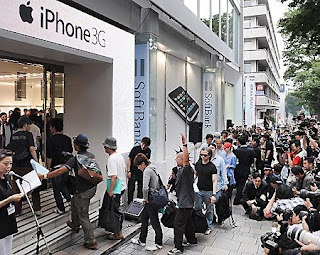 Long queues for products like the 2nd generation iPhone (3G is the type of network) launched earlier today in Japan and several other places like Hong Kong saw long snaking queues that stretches for several kilometers that don't seem to have an end. Similar queues like this happened back when the PlayStation 3 was released or for any Comiket that is held twice every year at the Big Sight (Tokyo International Exhibition Center). Queues like this usually start a few days before the release. I don't like being in queues with 10-20 people ahead of me, but with hundreds of people for the same thing, I don't know. I could face the high likelihood of the product being sold out if I am at the back or even the middle of the queue. I certainly don't have the time to queue for long hours either. I would rather avoid this queue and go and buy the iPhone a few months later. By then, the queue would have become shorter and the amount reserved to those who pre-booked it lesser. It could also be the time to see the bugs and updates features that are currently not announced.